During summer holidays Ucom offers its mobile subscribers the opportunity to enjoy 100 MB, 300 MB and 1GB bundles of internet in roaming, which will enable them to benefit from more affordable rates of mobile internet abroad. In particular, from June 27, by choosing one or a few of the aforementioned bundles and connecting to Magticom or Geocell networks in Georgia, during 30 days the customers will be able to benefit from 100 MB, 300 MB or 1GB internet bundles when roaming around Georgia. 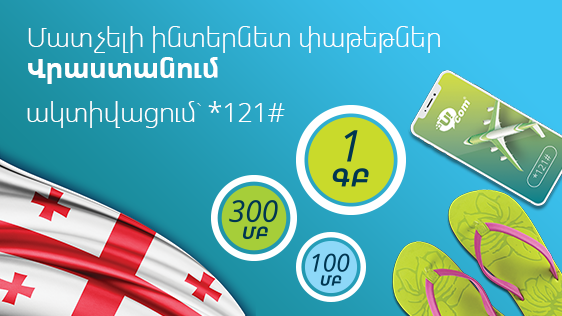 They simply have to activate the roaming service before departure from Armenia and choose preferred bundle by dialing *121#. Let us also remind, that this summer Ucom subscribers have an opportunity to benefit from a mobile internet at an affordable rate of 15 AMD/MB in Egypt, Greece, Italy, Spain and 39 other countries.